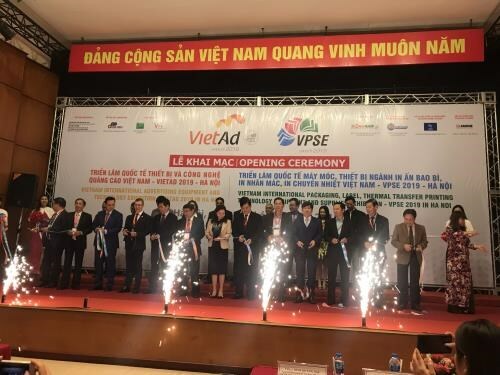 Hanoi (VNA) – The Vietnam International Packaging, Label, Thermal Transfer, Printing Technology Equipment and Supplies Exhibition 2019 (VPSE 2019) kicked off in Hanoi on March 20. The annual event was initiated by Dong Nam Advertising and Commercial Promotion JSC and held in conjunction with the Vietnam International Advertising Equipment and Technology Exhibition (VIETAD 2019). It offers a good opportunity for domestic and foreign organisations and enterprises to seek partners, transfer technologies, and develop business, contributing to increasing the quality and competitiveness of products, according to Vice Chairman of the Vietnam Advertising Association Nghiem Truong Son. The VPSE 2019 features nearly 500 pavilions displaying a wide range of products in these fields.